McLaren Industries' recently launched line of heavy-duty equipment attachments gives fleet owners more options for driving their productivity. Our products leverage our longstanding expertise in design and engineering and include buckets, grapples, rakes and more — everything you need to get the job done with fewer passes. Our heavy-duty attachments fit on machines by all leading manufacturers, including Cat®, Case, Komatsu and more. Explore our current catalog using the links on this page — we are always expanding our offerings, so be sure to check back often or contact our office directly for assistance. Grapple buckets: McLaren Industries' grapple buckets feature a wide bottom lip and serrated teeth for gripping and cradling heavy loads while allowing smaller debris to fall through. 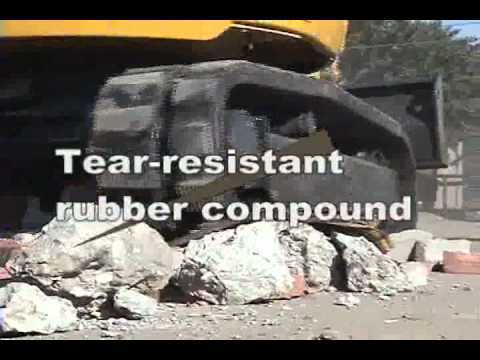 Available products include a heavy-duty grapple for moving logs, rocks and brush, an eco-duty grapple for occasional storm cleanup, and a demolition and recycling yard grapple with a solid bottom. All feature high-strength steel construction and a universal skid steer hookup. Stump buckets: Our stump bucket is the widest on the market — perfect for making quick work of stumps, palmettos, underbrush and vine masses. This high-strength product attaches quickly to any skid steer and will deliver maximum performance even when working with irregular or unbalanced loads. We offer this product with an optional hydraulic thumb for cleanup, demolition and other applications. Dozer blades: Our four-way dozer blade features a power tilt function for moving heavy rocks, earth and rubble. We also offer a special land clearing blade for knocking down trees, stripping hard dirt and making angled cuts for ditches, in addition to other land clearing, grading and backfilling applications. Both come in multiple sizes and offer superior ease of use and maneuverability compared to an OEM part. Excavator buckets: We designed our Cat-style excavator bucket to deliver the most usability for the lowest cost. Wear-resistant teeth and MR400 steel construction offer long-term durability, while an adjustable bushing system allows you to fine-tune the bucket's fit for optimal performance. The ideal complement to the most powerful excavators, our bucket attachments excel at moving rock, dirt and clay. In the construction, landscaping and material handling industries, keeping your operating costs down requires specialized equipment. Upgrading from an OEM bucket or rake to an aftermarket McLaren Industries alternative is an investment that can bring multiple benefits. Our products deliver value by allowing you to take on more demanding or complex jobs with a single piece of equipment — reducing wear and tear, extending machine and component life, and keeping downtime to a minimum. Our lineup of heavy-duty attachments for compact loaders, multi-terrain loaders and excavators is exclusive to McLaren Industries. We manufacture all components in-house, allowing us to exercise an industry-leading level of quality control. We also stand behind everything we sell with excellent customer service and fair pricing. To learn more about finding the right attachment for your machine, contact us online or call us at (800) 836-0040.